We take a look at a recent example of a kit we supplied to a self-assembly customer. 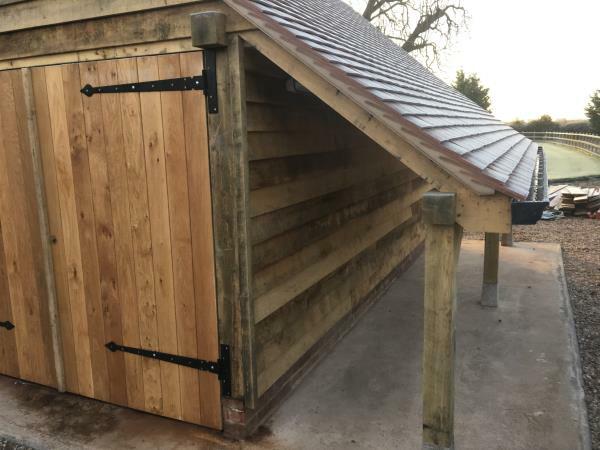 Earlier this year we were contacted by A & M Kitchen and Joinery, as they had a client who was looking for secure parking for one vehicle, an area to keep firewood and additional storage. One of the one-bay oak framed garage kits from the ‘Chippy’ range fitted the bill, with the addition of a log store, partition, doors and oak weatherboarding. As with many of the kits we supply, the customer opted to assemble the frame themselves (on behalf of their client). All frames are dry-fitted in workshop to ensure ease of fit and a smooth build. After the project had been completed, A & M were kind enough to provide us with some positive feedback. 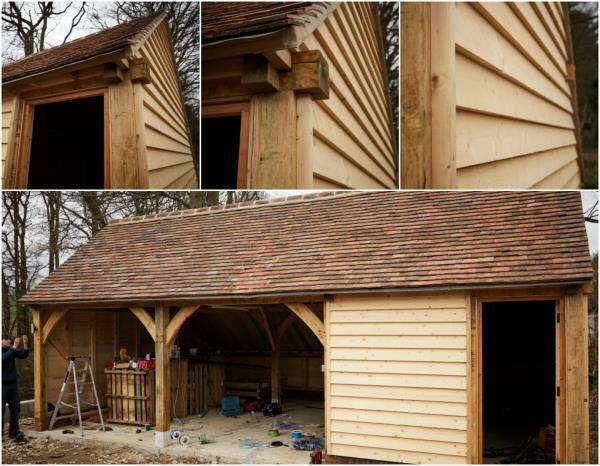 “I believe the garage was good value as the quality of the oak doors and work man ship in the structure was very good. I would recommend your company to others” said Adrian Brooks, MD of A & M.
Whilst Chippy frames are suitable for self-assembly, even by an accomplished DIYer, we do have our nationwide teams of fitters. We also supply ground work and roofing services. 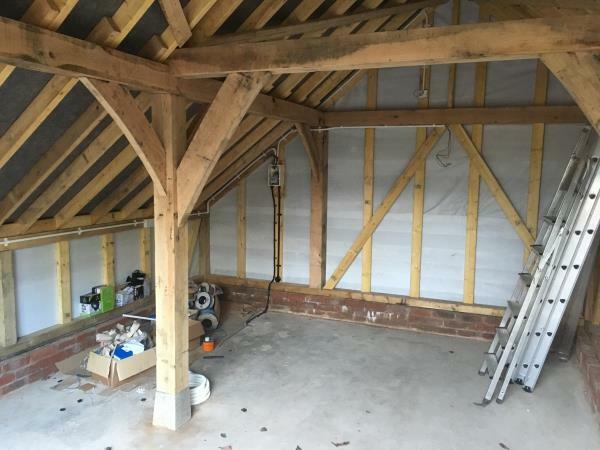 As you need to have faith in your supplier when purchasing something as significant as an oak frame, we thought you might be interested to read some of the feedback we have recently received. 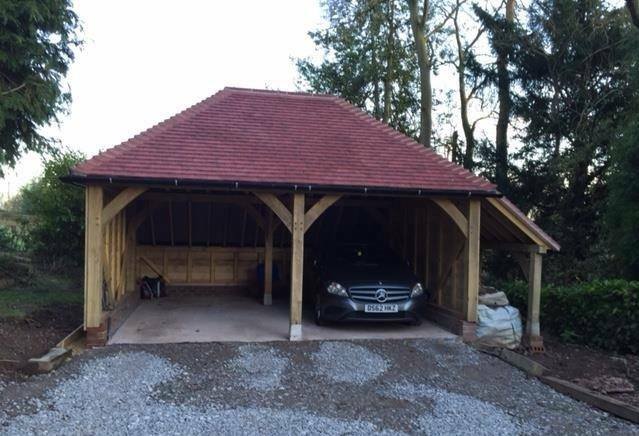 Back in November we delivered and erected one of our CH2HL two bay oak framed garage kits for Linzie Forrester from Staffordshire. Linzie said ‘Delighted with the finished product. I can say with absolute honesty that it was a great experience dealing with your company. The staff were lovely and really very, very helpful. It’s a rare pleasure these days to find an honest, upfront company who do what they say, for the price quoted at the time agreed! I’m a very happy customer.’ She also sent us this great photo. We recently worked with A & M Kitchen and Joinery in Worcestershire to provide a one bay oak framed garage kit to one of their customers. 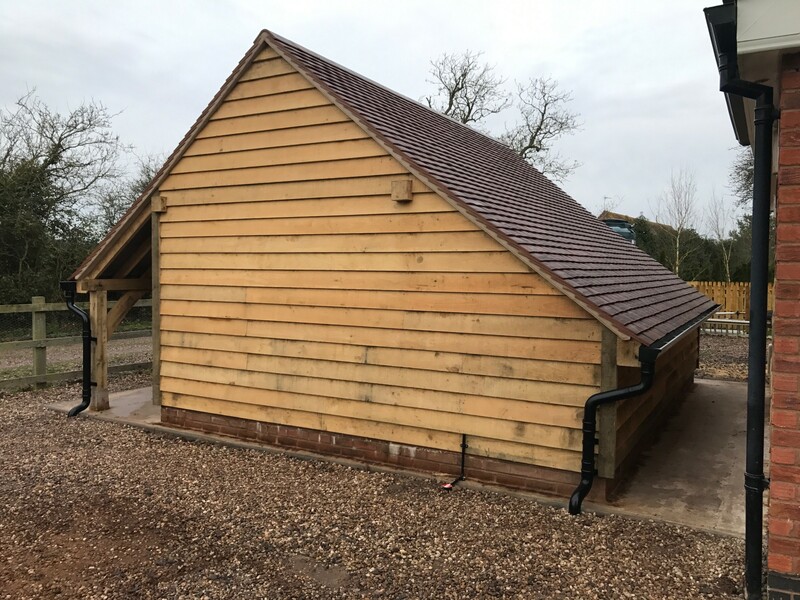 Director Adrian Brookes found us online and chose the CH1GA that comes with a gable roof and side aisle and he also chose to add a log store to the side. We provided both the frame and the joinery for this project and Adrian assembled it himself. See the below images of his finished garage. Local customer Chris Boyce from Kent recently purchased this three bay garage kit. He chose the CH3G and we did the frame, assembly, joinery and bricks. ‘You have been flexible with dates changing for the install and the actual build was very quick. It’s the little things that stand out for me, the use of oak pegs and staggered joints on the weatherboarding – it looks like a quality project’ Chris said. Contact our sales team 01435 860 260 to discuss your own project or download our brochure below! We are offering additional savings on our CH2G oak framed garage kits. Recently we reduced prices across our entire range of oak framed garage kits by 10%.We have made even further reductions to our CH2G model so that it is now available for just £3295. The CH2G is one of our more popular models. 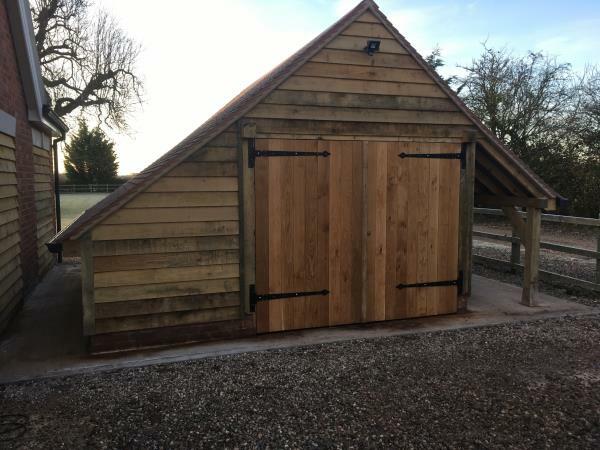 It features a traditional gable roofline and parking for two vehicles, although many customers opt to partition one of the bays for storage. It stands 5.6m wide, 5.3m deep and has a cat slide to the rear. As with the entire Chippy range, it is suitable for assembly by general tradespeople or even accomplished DIY enthusiasts. Alternatively, we have teams of fitters who travel nationwide and can also offer groundwork and roofing services. Don't forget we that also manufacture bespoke frames should our standard designs not meet your exact requirements. Contact our sales team on 01435 860 260 for further information. Frame Prices Reduced by 10%! Despite the current economic climate, we are reducing the cost of our Chippy oak framed garage kits by 10% given the efficiency savings we have recently achieved. Our traditional CH2G (two-bay with gable roofline) model has been reduced even further - so is now available for just £3,295 plus VAT. Like many businesses, we are facing the double blow of a falling pound and rising raw material costs, but have been more than able to offset these impacts by analysing and developing our manufacturing activities. This year long process has required significant investment - particularly in machinery - but has proved more than worthwhile given the savings we are now able to pass on, with oak framed garage kits now available from just £2,395.00. The range of ‘Chippy’ kits comprises 47 standard designs, from 1 to 4 bays, in a variety of roof profiles. Additional options of half-bays, log stores and side aisles allow for most requirements to be catered for (although modifications are possible). Kit frames appeal to many customers as they are pre-designed, represent excellent value and are typically available on shorter lead times. We even keep some of our frames in stock. Chippy kits are also suitable for self-assembly by general tradespeople and even accomplished DIY enthusiasts; full instructions are supplied and posts are pre-cut and numbered. 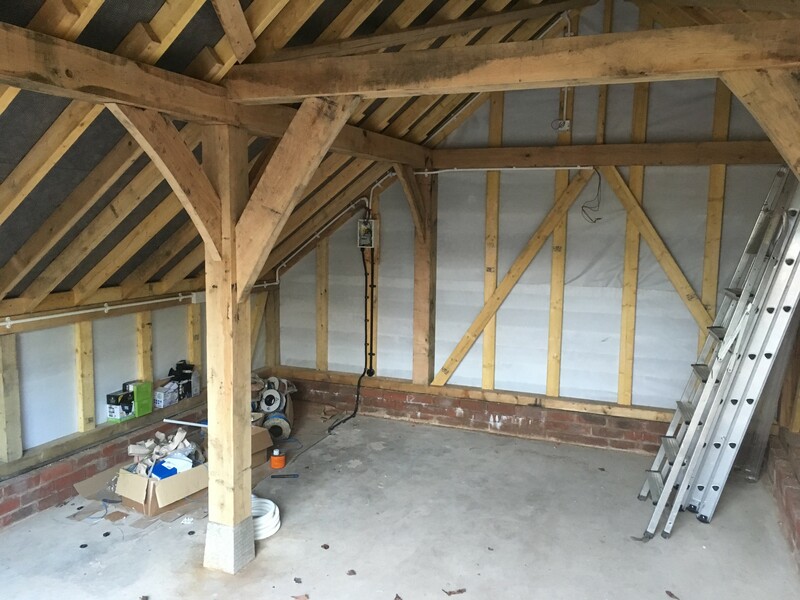 Dry fitting in the workshop ensures quality and ease of build once on site. Alternatively, we do have our own teams that travel nationwide to assemble both kit and bespoke frames. They can also carry out groundworks and roofing should a full service solution be required. A further advantage of Chippy kits is their possible exemption from planning requirements. As the ridge heights are below 4m on all designs, permitted developments rights are granted for the majority of projects. The smaller frames in the range are also exempt from Building Regulations (having an internal footprint of under 30/m2), providing certain site criteria are met.